2018 is the third year in a row that the sector is experiencing serious weather problems. This situation illustrates the vulnerability of both European vegetable growers and processing plants due to changing weather patterns. Field losses have resulted in a reduced and irregular supply of fresh vegetables to processors. This in turn has led to increased production costs and then a reduced quantity of processed product. All leading European production areas have been affected by aberrant weather conditions in recent months which rendered the curing of vegetables unusual. Many waterways have dried up and the pumping of irrigation water has been frequently restricted. Vegetables have continued to suffer because of the constantly hot and dry weather in large parts of Europe, resulting in a sharp drop in yields. This situation for vegetable growers and processors has not been experienced in the last 40 years. Strikingly lower yields of 20% to 50% were reported for peas. The situation for beans (green, yellow and flageolet beans) was also alarming, with losses of up to 50%. 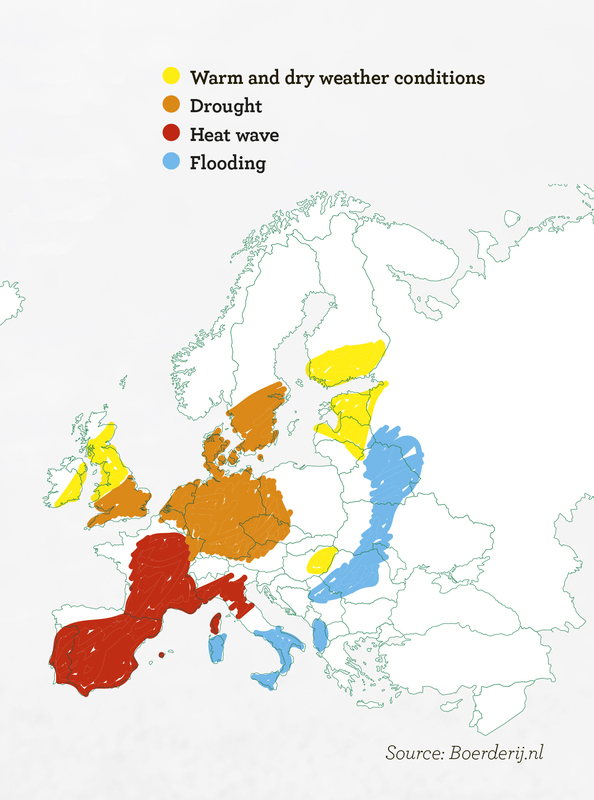 The first beans harvest in some southern European production areas was also affected by severe storms, floods and hail. Losses of 15% to 50% were recorded for onions. Courgettes and spinach were also affected. In many areas, there was no second harvest of spinach, beans or cauliflower due to drought. There was also greater concern about the harvest of winter vegetables such as kale, red and white cabbage, sprouts and leeks due to the prolonged drought. It is already clear that the too-dry summer months will result in lower than average yields for these crops. You receive maximum 1 newsletter per month.